Closing weekend, world coffee prices were mixed on two futures exchanges. On the ICE Futures Europe exchanges - London, Robusta coffee prices continue falling. September futures fell 11 USD, equivalent to 0.66%, down to $ 1,650 / ton, delivery period in November also fell by 11 dollars, equivalent to 0.66%, while the $ 1,666 / ton, and the period 1/2016 January delivery was down limit of 11 USD, equivalent to 0.65%, still $ 1,683 / ton, relatively light losses. Trading volume was below average. 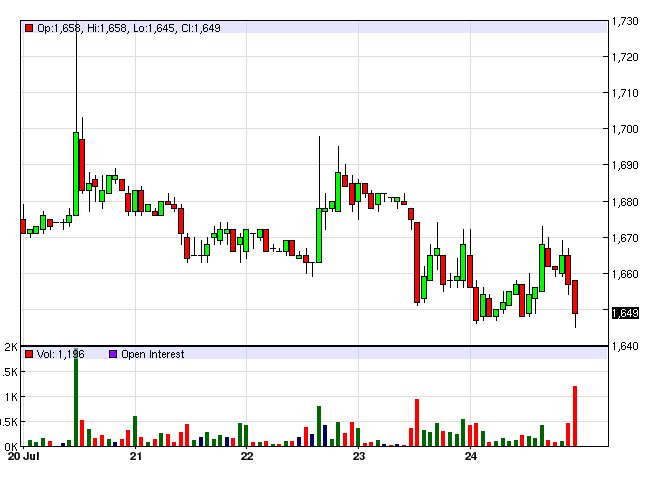 In contrast, on the floor ICE Futures US - New York, Arabica coffee prices ended the string of consecutive decline. September futures rose 0.7 cents Affairs, which rose 0.58% to 122.25 cents / lb, December term delivery rose 0.6 cents, or about 0.48% to 125.65 cents / lb and futures for April delivery rose 0.55 cents 3/2016, which rose 0.43% to 129.25 cents / lb, the slight increase. Trading volume on average. The price of green coffee in the Central Highlands province fell by 200 VND, down at 35300-35900 VND / kg. Robusta export price category 2, 5% black and broken, reducing the level of $ 1,710 / ton, FOB - HCMC, maintain the difference plus 60-70 dollars at the September futures price in London. For the whole week, the price of robusta coffee futures fell $ 25 / ton, equivalent to 1.49%, the price of coffee beans in water bucket dropped 600 dong, equivalent to 1.66%, while the price of coffee Arabica futures dropped 6.25 cents / lb, which fell 4.86%, the biggest decline. World coffee prices are fluctuating at low levels due to many forecasts Brazil will harvest despite drought early flowering coffee making service slow. Weather South America began under the influence of El Nino weather phenomenon around the Pacific rim causing major coffee growing areas southeast Brazil made progress more rainfall delayed harvest rather than every year, report the consultant - research and analysis Safras & Mercado said in Sao Paulo. El Nino weather phenomenon has caused drought in Colombia last 2 months, threatening the position of coffee makers globally the third largest country in the Andes which has just regained, Rabobank has warned. The bank also confirmed Arabica coffee prices ended the year at around 138 cents / lb higher than his own prediction made in April, do Brasil exports fell in 2015/2016 crop year and inventory cushion Jointly been exhausted. Reference price on the London futures market becomes weak prices prompted the resistance continued in the domestic market that exporters Vietnam and Indonesia requiring higher price differences do business with part stalled. Vietnam robusta grade 2, 5% black and broken, with a plus 50-70 dollars and Sumatran coffee grade 4, 80 county error, plus 60-80 USD compared to futures prices. Meanwhile, a Reuters survey result Arabica coffee prices will end the year at 143 cents / lb and Robusta at $ 1,815 / ton. According to an analysis by TechNavios, research firms and technology consulting for multinational corporations, showed that coffee consumption in the domestic market will grow at double Brazil with approximately 1.19% increase in four next year, promises to become a coffee consuming country's second largest after the United States. This is a long-term threat Brasil coffee supplies for the consumer market, although Brazil is no longer affected by the climate issue on the production of coffee and has annual production capability will at around 60 million bags. But what is remarkable is the large consumer markets such as Western European tradition, North America is moving away form into coffee cup coffee capsules coffee and small self-service to save costs to consumers used in the context of economic weakness at present.